Norwalk Wall Street businessman Michael McGuire speaks to the Common Council Planning Committee, Thursday in City Hall. NORWALK, Conn. – The description of the Wall Street area as “blighted” has been changed to “deteriorated or deteriorating,” in a revision to the proposed Wall Street-West Avenue Redevelopment Plan. Multiple commenters responded to the change with protests at Thursday’s Common Council Planning Committee meeting. Speakers were at a bit of a disadvantage in addressing the revision as it had only been posted to the City’s website the day before. The plan has grown from 171 pages to 189. Another change: rather than claiming that 385 properties fall under the definition of “blight,” it now states that 73 percent of the 372 parcels in the area have 30 percent deterioration, and 36 percent have at least 40 percent deterioration, which makes the area legally eligible for a redevelopment plan. The term “Innovation District” was publicly dropped more than a month ago, and the Ordinance Committee is considering a “Real Estate Tax Agreement Ordinance for Wall Street – West Avenue Neighborhood Plan Area,” which will be part of the redevelopment plan. Members of the Wall Street Neighborhood Association have objected to the “blight” designation and the “extraordinary regulatory control” such a plan would bring. The Association, in a letter to the editor last week, attacked the blight designation which is the Redevelopment Agency’s legal justification for having a redevelopment plan. The Common Council would have to approve property takings by eminent domain and is also slated to have approval on any tax breaks associated with the plan. State statute says that a redevelopment area must be area blighted or of a menacing nature, to the point that police intervention cannot resolve the problem, Wall Street businessman Mike McGuire said Thursday, asserting that the description does not applies to Wall Street. “Did this guy take the time to figure out and look at the fact that this is a historic area, so therefore depreciation of buildings is likely to be a little higher?” McGuire asked. The Redevelopment Agency, in response to McGuire’s charge last month that the term “blight” was being misused, asked Harriman, formerly The Cecil Group, to review data from the tax assessor’s office, Director of Community Development Planning Tami Strauss said later. “People thought the RPA analysis was too broad and too overreaching so we asked a different consultant with experience in this area to take a look at the Wall Street area to see if it is deteriorated or deteriorating,” she said. Jason Milligan came next, asking if the 18 pages added to the plan made it a significant change, and therefore eligible for a public hearing. “This is your opportunity to speak, this is not a Q and A part of a meeting,” Planning Committee Chairman John Kydes (D-District C) replied. The plan gives Redevelopment the right to take property, Milligan said, although that power rests with the Common Council. He also pointed out that Steve Cecil works for Harriman and implied an issue there. “Amazingly, in the period of three weeks, he analyzed the entire redevelopment plan area, found that it’s blighted, it does so happen that they have six active consulting projects going on in Norwalk right now,” Milligan said. Norwalk resident Kevin Dailey also spoke against the plan. “The plan appears to aggregate power in the hands of a few entities like the Redevelopment Agency, the redeveloper and whoever that chosen winner might be, and the Council obviously has some power,” Donna Smirniotopoulos said. “The term ‘designated redeveloper’ is worrisome, especially in the context of Wall Street Place, which stands in grim testimony to the dangers of government overreach and lax oversight,” she said. Strauss went on to explain to the Council that they will receive printed copies of the new plan Monday. 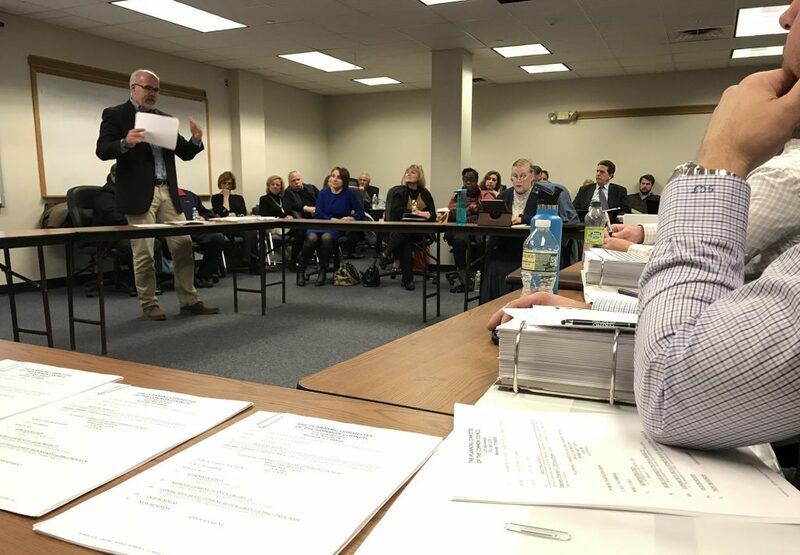 The Committee has been scheduled to vote on it in early March; Redevelopment Agency Executive Director Tim Sheehan pointed out that it’s up to the Committee if they want to hold an additional public hearing. The Agency could hold one if it wanted to, and after the Council votes on it, it needs Redevelopment approval to be enacted, he said. Depreciation, meaning a building is not brand new does not equal deterioration. Not even close. Harriman may have just implicated themselves in an FBI investigation. Did the Redevelopment Agency pay Harriman for the recent work? Was there an RFP for the work? Did they set foot in Norwalk to determine deterioration on a massive scale? Was Harriman asked to determine if the area is blighted or not? Or more likely was Harriman asked to justify blight/slum using any method possible? To determine an area in CT as a “Redevelopment Plan Area” it is an extraordinary step. Property owner rights are affected. To establish a plan area it must be significantly demonstrated that the area is a slum, a real menace to society. Clearly the Wall/West Ave area is not a slum! It is a vibrant improving area. The question is what level of fraud will the RDA and their consultants be able to get away with. Save the resources for areas that are really a slum. Wall Street isn’t blighted (aside from that godforsaken Tyvek Temple); it has character. Please don’t take away some of the last remaining vestiges of our city’s character. I am glad to see the energy and interest of the Wall Street neighborhood Association businesses. However, most do not live in Norwalk and live in homes or neighborhoods affected by the ‘deteriorating’ or ‘blighted’ (whatever you want to call it) condition of Wall St. Their input is important but it’s not everything. I read the Wall Street plan and it’s not perfect but there was much to like. I want to be sure other voices are looking out for Wall St also. The Wall/West Plan is a nice read, but how is it different the plans for the last 6 or 7 decades? There is a difference between talk and results. The Wall/West area is not a slum! All attempts to label it as a slum are dishonest and potentionally illegal. Case closed. The question is how many people will continue to implicate themselves. “Real Estate Tax Agreement Ordinance for Wall Street – West Avenue Neighborhood Plan Area,” is the key. This is all a means to get the innovation district approved. Developers need to help to build stuff that wouldn’t survive in the wild on their own without government money and control. And I don’t think that Jason will be one of those preferred developers. Just a hunch. Hmmm… more property tax credits for friends, questionable declarations of blight to secure government funding for housing, all while the poverty rate in our schools climb and leafy neighbors set their hair on fire at the prospect of regionalization. City and state management at its finest. After 50 years of scant progress on the County’s shabbiest Downtown Norwalk residents are still having difficulty with the common sense notion that electing Mayors and other officials lacking basic business skills and experience has major negative consequences. Business development success requires business knowledgeable elected officials and development professionals on the City Hall staff. Norwalk has neither. So we know our future. Ever more punitive taxes, falling property values, continued stagnant Grand List and exodus of our most capable residents. The skills of a former police Chief are not up to the task of expanding Norwalk’s very small business sector. And that has been true of every one of our Mayors for many decades. Easy to blame our Mayors and Council members. But the real cause for our distress lies in looking in the mirror. We’re comfortable with a declining City. After all few plan to retire here. Nor do our City employees seek to live here. This morning the city sewage truck was once again on Wall St by the Harbor View apartments. They had a big tube down the man hole once again clearing the sewer line. How much is this costing the city? How long before the street has to be dug up? Didn’t they know the sewer could nor handle all those apartments? My question: Why can’t the city agency’s, specifically Redevelopment, Planning, Ordinance and the Mayor’s Office understand that Norwalk is a City, albeit composed of interrelated communities. Activity in any one area affects all the communities! The city as a whole does not want the Redevelopment Plans for the Wall Street area as noted in that 1st POCD report! Plain and simple! Virtually every one wants the POCD activity (representing the entire city) to reach a conclusion for the city over the next 10+ years. Let that process move forward. No more “Divide and Conquer”, ill conceived sector plans to undercut the POCD process! “Jason Milligan came next, asking if the 18 pages added to the plan made it a significant change, and therefore eligible for a public hearing. Oooh. Ouch, Mr. Kydes. Talk to the hand. Mr. Milligan was asking a rhetorical question to spur dialogue and contribute to the already occurring subject matter. Why the abrupt smack down? Norwalk needs new management. Engaged stakeholders do not deserve to be marginalized and treated dismissively by council members. My hope for this city is that the next crop of council members are more friendly and approachable, and more appreciative and respectful of their engaged stakeholders and the value they bring. These state and municipal improvements will encourage new investment into the Wall Street CT neighborhood: 1) angled parking for retailers with meters, 2) repairing the torn up streets; 3) making a portion of the street one-way, 4) improving streetscapes with additional trees and tree wells, 5) removing the interstate lights and replacing them with attractive city street lights with electrical outlets for holiday lighting, 6) having an active historic society that preserves character, 7) re-opening the train station, and 8) having a very active community of residents and business owners. In the Wall Street neighborhood, we have achieved 2 out of 8, and we are working on the rest. Great stuff, Nancy McGuire. Thank you for all that you do. Wow – it only took us about five minutes to determine that the assessor’s estimated market values in the Plan area where up significantly from the prior 2013 Reval. It does not take a rocket scientist to see that there is no deterioration in the Plan area. We then went on and spent around 6 hours breaking out all the data on a property by property basis in the Plan area. Turns out that only 3 properties had a loss in value, all the others had an increase in value between 2013 and 2018. For Harriman/NRA to spend a week doing this work (and ignoring the obvious) would suggest a search for something that is not there. Therefore what was presented by Harriman (with no backup or support) is most likely the result of taking the assessor’s data out of context. How convenient. This statement appears to support the contention made here by several commenters that there is an ongoing effort, first the innovation district now a tax plan -in a made-to-fit finding by a conflicted 3rd party. How does this assessment affect the owners of said properties who wish to sell? Is it a reach to say – this hurts them? What happens their valuation when a future buyer must accept that they may lose their purchase to a land grab by eminent domain? Unelected, autonomous agency? Someone should gather these property owners together, and investigate legal remedies. Find a specialist attorney, one without connection to firms who feed from the local trough, and sue the Redevelopment Agency, sue Tim Sheehan (directly – why should he be indemnified? ), sue the city. Name Harry & the Common Council members as defendants. This is the only thing this group understands: lawsuits. Day 1, demand the judge keeps the proceedings public – no zip-locks. Let the public know everything. Start at real damages (20 million), and then reach to 100 million punitive. Take the entire rainy-day fund. Then re-invest the proceeds into the city center.